The acclaimed “unique” Fancy Jeans Party is here! Are…You…Ready…? Dance the night away overlooking the Intracoastal Waterway while enjoying an open bar and tasty delights from some of the most popular restaurants in South Florida. Fancy Jeans Party, chaired by Jen Klaassens, Vice President of Programs for The Wasie Foundation and produced by Events by Vento Designs, will include live interactive entertainment, a “Best Dressed” contest, a raffle for a chance to win a brand new FORD automobile, three exclusive travel prizes, and a fabulous silent auction. Special entertainment will include silhouette dancing, Fancy Jeans stilt walkers, and guests painting a giant canvas with performance artists from ART ARMY. 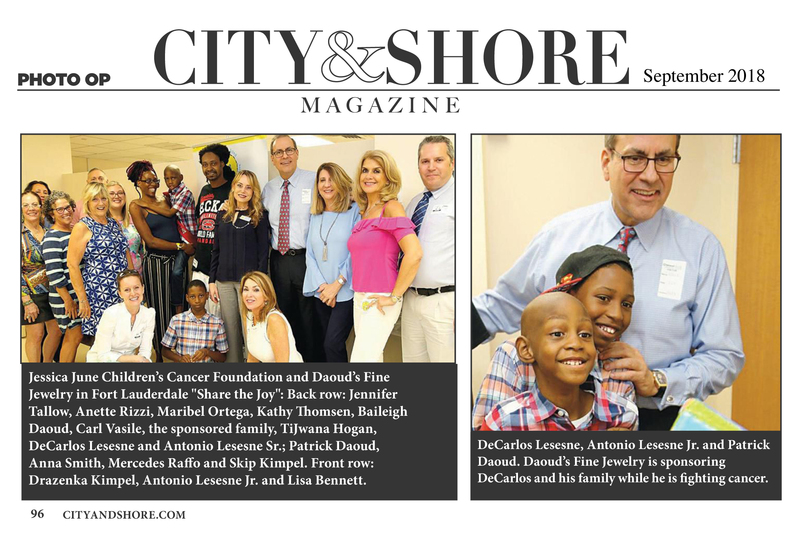 Proceeds will benefit children fighting cancer in the tri-county area of South Florida. 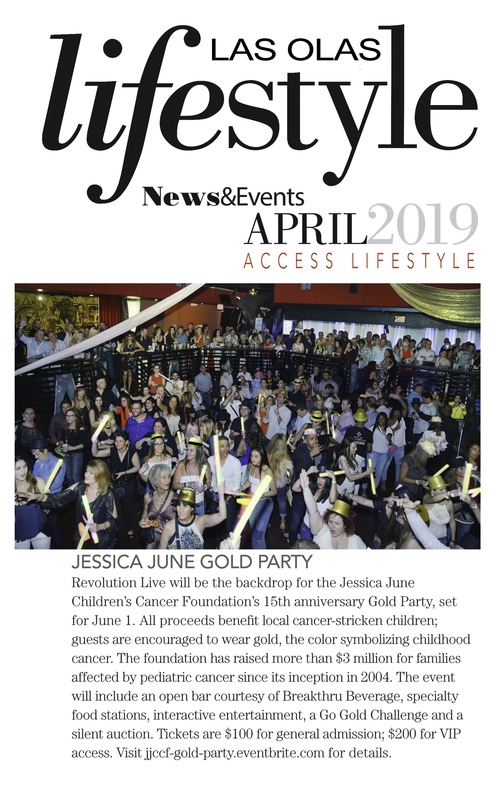 The Jessica June Children’s Cancer Foundation invites local businesses and individuals to support the Fancy Jeans event through sponsorships, in-kind donations or program journal advertising. Confirmed sponsors: The Wasie Foundation, Premier Beverage, Nature’s Products, Florida Panthers Foundation, Bacardi, Leblon Caipirinhas, American Airlines, Chris Evert Children’s Hospital, Joe DiMaggio Children’s Hospital, Miami Children’s Hospital, Advocate Home Care Services, The Harry T. Manguarian Jr. Foundation, Landmark Bank, Camillo & Snowden, PA, GMAIR, Broward Bank of Commerce, Bloom, Gettis & Habib, PA, Dr. Yolanda Cintron, DMD, Dr. Leslie H. Sultan, DMD, Yellow Cab, Events by Vento Designs and KP Design & Photography. Food Sponsors include Valentino’s, Truluck’s, Capital Grill, Hyatt Pier 66, M Bar, Gotham City Cupcakes and UdderSweets. 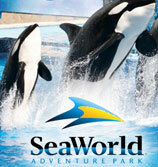 Media Sponsors include Sun-Sentinel, Think Magazine, Las Olas Lifestyle Magazine, Eye on South Florida and Majic 102.7. The raffle is a Fancy Jeans event tradition. 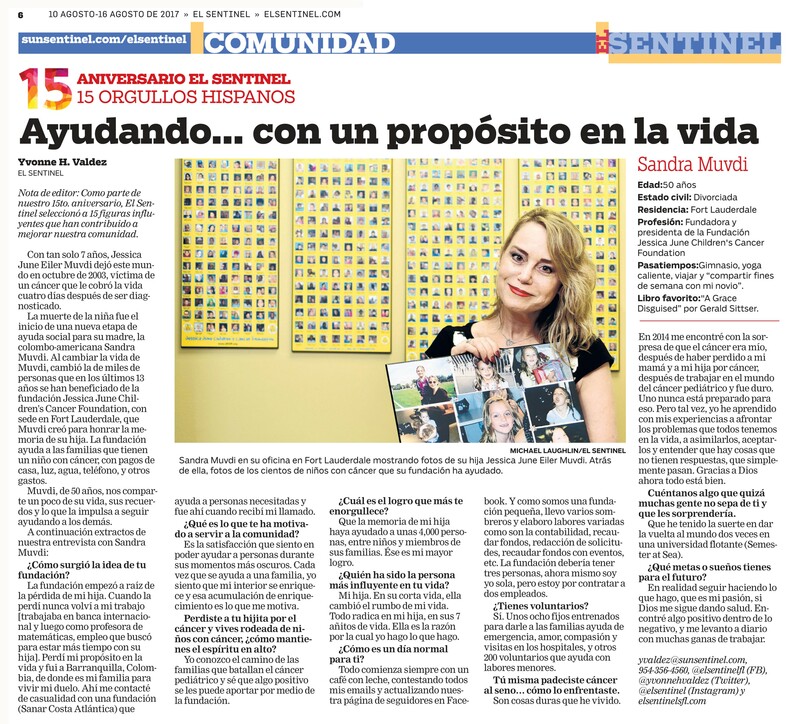 Raffle tickets get sold by volunteers and online two months before the drawing. In 2005 JJCCF had its first Fancy Jeans event & raffle. The event and drawing took place at Blue Martini Galleria Mall in Ft. Lauderdale. 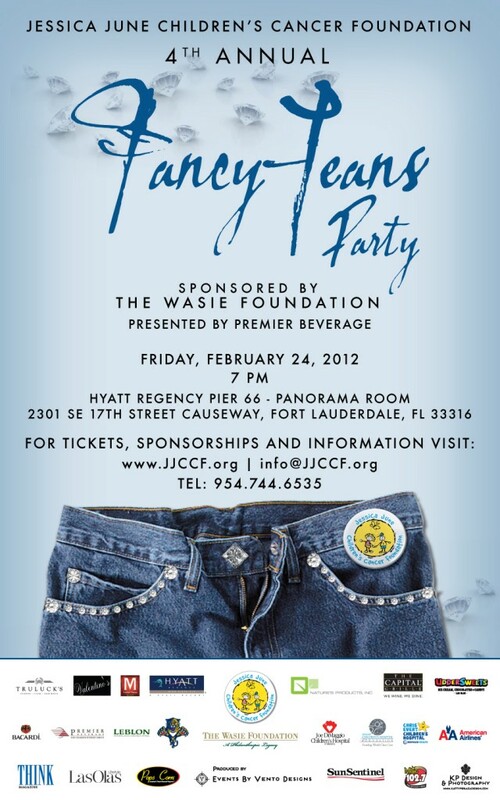 The raffle drawing will take place during the Fancy Jeans Party on Friday, February 24, 2012 at the Hyatt Regency Pier Sixty-Six Panorama Ballroom, 7-11 P.M. Our Child Honoree, Angel, will be drawing the winning tickets. 100% of the proceeds benefit children fighting cancer. Attendance is not required to win. 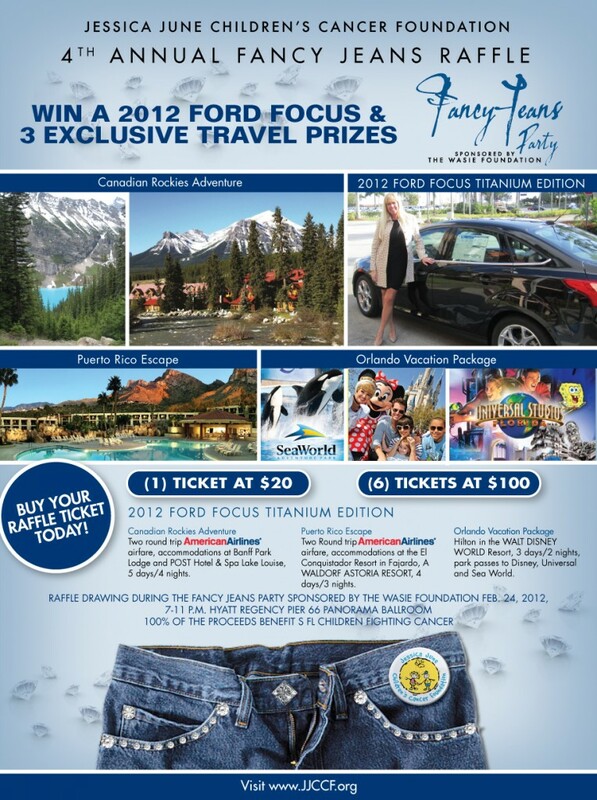 The 4th Annual Fancy Jeans Raffle includes a chance to win a brand new 2012 FORD Focus Titanium Edition Automobile and three exclusive travel prizes. Fancy Jeans was the Jessica June Children’s Cancer Foundation first social fundraising event started December 13, 2005 at the Blue Martini Galleria Mall in Ft. Lauderdale. 100% of the proceeds from this event fund the Emergency Financial Assistance Program for families in crisis impacted by childhood cancer. Fancy Jeans Parties have raised over $225,000 to help these families meet their everyday basic human necessities such as food, shelter, utilities and medical treatments. The Fancy Jeans raffle has always been an event tradition including extraordinary travel prizes, but this year the raffle’s main prize will be a brand new FORD automobile. 1.The Jessica June Children’s Cancer Foundation (“JJCCF”), a not-for-profit charitable organization whose principal place of business is 1600 S. Andrews Ave. Fort Lauderdale, FL 33316, will sponsor a drawing for a 2012 Ford Focus Titanium Edition. The drawing will be held at the 4th Annual Fancy Jeans Party Sponsored by The Wasie Foundation on Friday, February 24, 2012 at 10 p.m. The winner will be selected through a random, blind drawing of ticket entry forms from tickets distributed by volunteers and representatives of JJCCF. Ticket entries must be completed, returned to and received by the JJCCF before 9:30p.m.on Friday, February 24, 2012. 2.Participants and winner must be 21 years or older, a U.S. resident and have a valid U.S. driver’s license. 3.Tickets may be obtained through representatives or volunteers of JJCCF or by sending a self-addressed stamped envelope to the address above or by calling 954-712-6322. They also may be obtained at the JJCCF website at www.jjccf.org. Online purchases must be paid by credit card. Only official entries will be accepted. No facsimiles are permitted. 4.JJCCF assumes no responsibility for lost, late, misdirected or non-delivered mail or other failure to deliver tickets prior to any deadline. 5.Purchases of raffle tickets are not tax-deductible contributions for federal income tax purposes. 6.Officers, directors and employees of JJCCF and their immediate family members living members living in the same household are not eligible to participate and win. 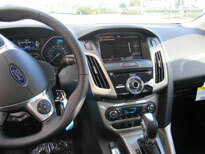 7.Vehicle MSRP $25,680. The winner will be responsible for any and all federal, state and local taxes (including but not limited to 25% federal withholding tax on the value of the prize). Withholding tax must be collected before the winner can take possession of the vehicle. 8.Odds of winning depend upon the total number of tickets distributed. No more than 3,000 tickets will be distributed. Drawing tickets are not tax-deductible. 9.Participants do not have to be present to win. The winner will be the person whose name appears upon the ticket entry form drawn at random. In the event the participant whose name is drawn cannot be contacted within five (5) days after the drawing, an alternate ticket entry form will be drawn at random and the participant whose name appears upon the alternate ticket entry form will be deemed the winner. Vehicle shall only be delivered in the state of Florida. 10.JJCCF retains sole discretion to determine, and shall be the final judge of, compliance with the rules and conditions of this drawing. 11.No substitution will be made for the advertised prize. 12.The winner shall be required to execute an affidavit of eligibility and a publicity release permitting JJCCF to use their name, photograph, likeness and voice for promotional purposes in any media. 13.This drawing complies with all state and federal laws and regulations. Tickets are void where prohibited by law and the name of the winner will be disclosed as required by law. 14.Neither JJCCF nor its officers, directors, employees or agents provide any warranties, express or implied, with respect to the car. Without limiting the foregoing, specifically, neither JJCCF nor its officers, directors or employees provide warranties of fitness for a particular merchantability or assume or authorize any other person to assume for them any other obligation or liability in connection with the car or otherwise. Furthermore, neither JJCCF, nor its officers, directors, employees and/or agents assumes any liability of any nature for any property loss, damage or personal injury occurring in connection with the vehicle, the drawing ceremony, or as a result of the winner’s acceptance or use of any prize. 15.By entering the drawing, each participant releases JJCCF, its directors, officers, employees, and agents from any and all liability for injuries, losses or damages of any kind caused by any prize or resulting from acceptance, possession, use or misuse of any prize. The winner agrees to indemnify and hold JJCCF harmless from any and all losses, damages, rights, claims and actions of any kind arising in connection with or as a result of the winner’s acceptance or use of any prize. 16.A copy of the official registration (#CH17913) and financial information may be obtained from the Division of Consumer Services by calling toll-free 1-800-435-7352 within the state. Registration does not imply endorsement, approval or recommendation by the state. JJCCF has not retained a professional solicitor. 100% of each contribution is received by JJCCF. 17.This drawing is governed under the laws of the State of Florida. 18.No contribution is necessary. 19.By purchasing a raffle ticket, you agree to be bound by these official Rules and Regulations and the decisions of JJCCF, which shall be final.